Justin Wong once again proves that he's far from done making his mark on the fighting game community. He reached the top of the mountain at East Coast Throwdown V.
RPD MCZ Gridman made waves by defeating EG PR Balrog to advance to the grand finals of the Super Street Fighter IV: Arcade Edition 2012 (AE 2012) tournament at East Coast Throwdown V. Unfortunately for him, Justin Wong pitched a shutout. 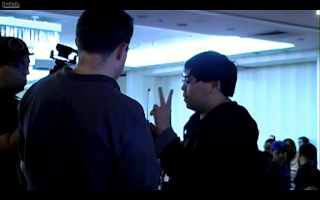 Wong used Rufus to sweep Gridman and take the AE 2012 prize.